Just for fun. Everyone show us what's on your desktop. Try to feature some applications you use often. And remember to protect the identity of innocents. RE-EDIT: Deleted the information, 'cos of a few people signing up top the forums asking about certain programs, without even knowing what Machinae Supremacy is. Ho-kay. here be me desktop. Background image is from the webcomic Girl Genius. 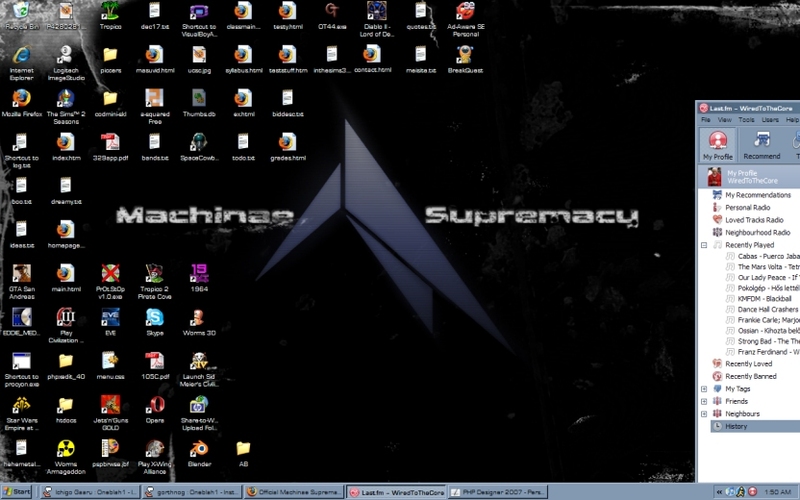 This is my desktop desu. It features Titans desu. It's on my old computer, which I am struggling to manage with a 20gig harddisk. Desu. 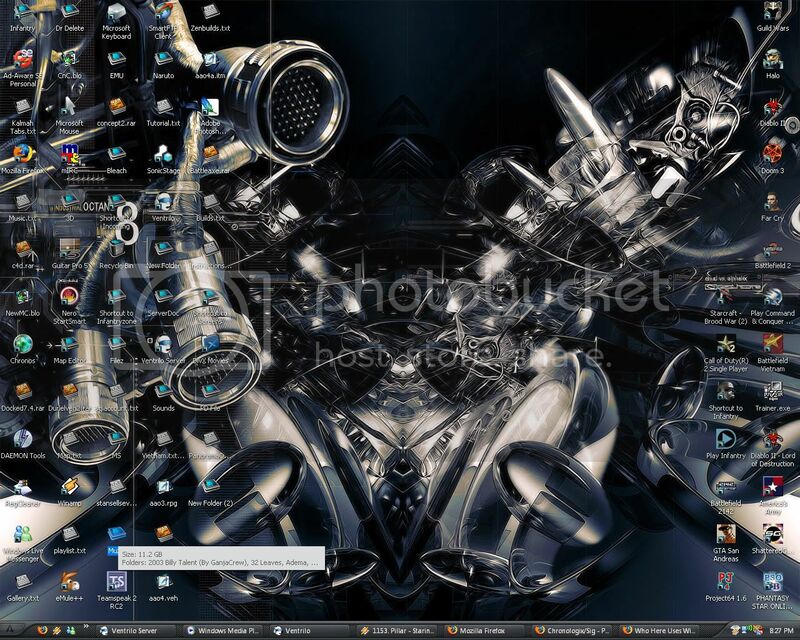 As usual, it's got winamp in the background, and I use the Gimp for most of my simple imaging needs. 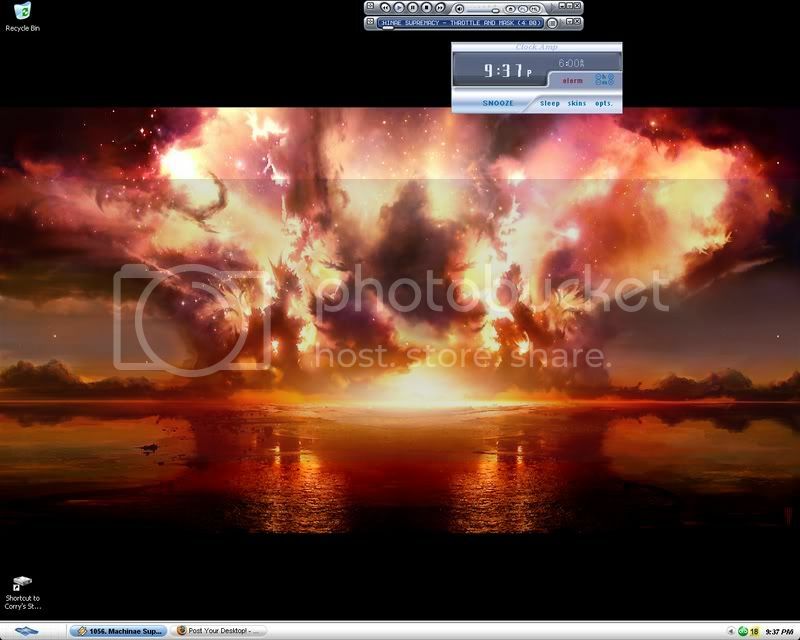 <--- Has a Winamp radio called "Zeit Faktor Radio"
Uses: Winamp, Windows Media Player, Photoshop CS2, Infantry, Guildwars, Ventrilo, Guitar Pro 5 and Firefox the most. It's amazing how much old crap I find lying around on it...I deleted my entire iTunes library that I haven't used in ages for an extra new free 816mb (It's a lot, okay?). I have all the stuff burned to disk anyway. I think that it's CUTE that you all have icons. Is that wallpaper by Hameed? It really looks like his style. my desktop is practical. which means, it has icons. i never saw the appeal of *not* having icons. its like, woohoo! a folder that is CONSTANTLY open, that i refuse to use! what marvelous efficiency! in other words, the cult of GTD is not for you, sirix. but i still love you. ouch!! rename that shortcut in the bottom left... it's bugging me. I rename all my "shortcut to"'s as well... Infact, my shortcuts are very organised and I shortened the titles so you dont have to click them to view the whole name. Windows Live Messenger becomes "wlm"
My Computer becomes "my pc"
..You get the idea. I'll post pics later. EeeK! Flowcharts! Or something similar. thanks to whoever that was. SpeedD. and the icons. eve online, gta san andreas, buncha txt files, diablo ii, gba emulator, n64 emulator, JnG, civ3 and civ4, various cd protection killers, and so forth.